Written by a Shingo Prize-winning author and Lean sensei, Lean Leadership for Healthcare: Approaches to Lean Transformation explains how to apply Lean improvement to both clinical and non-clinical processes. BOCA RATON, Fla. - April 18, 2013 - PRLog -- Healthcare organizations that have already applied Lean thinking to their processes, with the diligence of effective management and strong leadership support, are now realizing the benefits of their efforts. And, many of those benefits surpass what was thought possible just a few years ago. To be successful, these organizations had to provide the leadership to arrive at their future state. 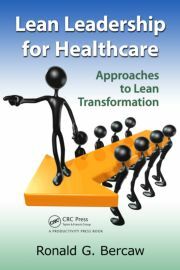 Written by a Shingo Prize-winning author and Lean sensei, Lean Leadership for Healthcare: Approaches to Lean Transformation explains how to apply Lean improvement to both clinical and non-clinical processes. It presents valuable lessons learned by the author over the years of leading improvements in this complex industry and lays out a clear roadmap for initiating your Lean improvements. Illustrating the leadership behaviors required to achieve sustainable success, the book is ideal for leaders in the healthcare industry looking to initiate Lean improvements to clinical and non-clinical processes. It reviews the fundamentals of Lean and explains how to link a strategy of continuous improvement to corporate strategy to achieve operational excellence. It also describes how to mitigate the risk of failure when undergoing large-scale corporate change—including what can go wrong and how to prevent these failures. The book includes case studies that share the time-tested insights of healthcare team members and leaders. It outlines a management system for sustaining your Lean improvements and provides the Lean leadership approaches, thoughts, and visual tools you’ll need to guide your organization along the path toward world-class healthcare performance. Ron has consulting experience in the healthcare sector (US and Canada Health Systems including primary care, acute care, and community applications of both clinical and back shop improvement), the commercial sector (administration, manufacturing, distribution, supply chain, engineering), and the public sector (US Army, US Navy, US Air Force including MRO, Pentagon, and Surgeon General Assignments). Ron is also a recognized author, published in November 2011, with the release of his book entitled, “Taking Improvement from the Assembly Line to Healthcare” detailing the application of the Toyota Production system to the healthcare industry. The book was recently awarded a 2013 Shingo Reasearch Award..